Moving from Survive Mode to Thrive Mode through Cold Water Swimming. This weekend I’m happy; I’ve completed a goal I set out to achieve a year ago - TO COMPLETE ONE FULL YEAR OF OCEAN SWIMMING. It’s funny that my year ends as it started, in glistening Spring sunshine, with my beloved Galway Bay looking like a tropical playground. 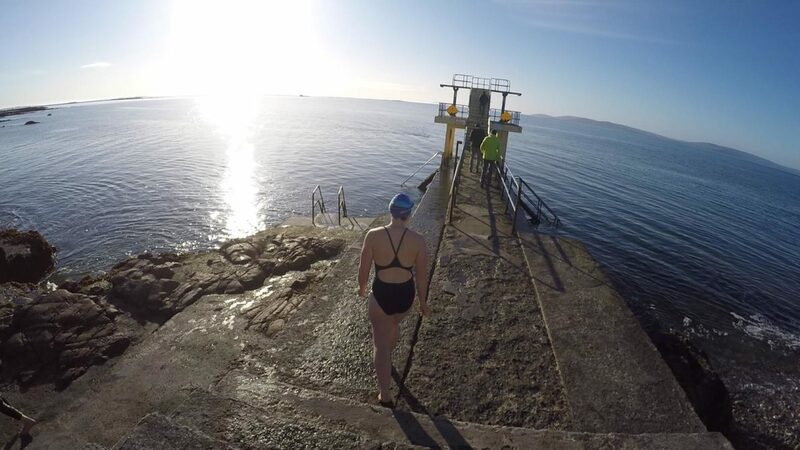 It is March 25th 2018, the water is 6 degrees, the air temp is 3 degrees, the natural world is thumping with life and it is great to be alive, to dive in and get swimming amongst it. The Atlantic Ocean is wild, varied and unpredictable, with a myriad of ocean moods that present themselves from calm glassy waters, to raging wild seas, snow, sunshine and everything in between. For me, the only constant in the past year has been my commitment to show up, get togged out and get in. Regardless of my mood, motivation, will, or lack thereof, I consistently swam into the ocean, and the sea has rewarded me greatly. Over the years, some of the healthiest people I have met have been perennial ocean swimmers. It defies all logic that entering a 5 degree ocean daily would benefit an elderly person of 80. Surely such exposure to extreme cold, harsh wind and wild ocean would equate to hypothermia, heart attack, pneumonia or even death? But the reality appears to be exactly the opposite – I have met healthy people who never get sick, who don’t need antibiotics; who modulate their neurogenic or musculoskeletal pain with cold water swimming; people whose depression is managed by the ocean and not Prozac. The lists of people and their stories are endless and endlessly interesting; the common thread of their stories is HEALTH – of BODY and of MIND and the restorative capacity of the ocean. My ultimate goal with One Year of Cold Water Swimming was to explore this idea of cold water immersion and health and see if it could help me to THRIVE. The Happy Pear twins from Greystones who dip daily in the sea in Wicklow have said they go down to the sea every morning ‘to drown the miserable man’. There is something in this statement that resonates with me. I have found in the past year – no matter how poor my mood, how low my energy levels or depleted my reserves – when I go into the ocean – I come out fully charged. Whatever baggage from my day I bring into the ocean – it leaves me in the water and I come out refreshed, reset and energised. The shock of cold water immersion gets me out of my head and into my body in a way that it is literally breath-taking. I am zapped back into the present moment with profound efficiency. The monkey brain, repetitive thought patterns, foggy mind, stagnant circulatory system and nervous system are shocked back to life and the present moment in the most immediate way. Fight or Flight – Live or Die – Breath – Pump Blood – Survive. Over time with continual exposure to the wild, cold ocean, I have learned that I can modulate my response to these conditions – controlling my breathing controls my body temperature, my heart rate and my initially panicked mind. Controlling these parameters in a short term stress state appears to allow for some kind of physiological and psychological adaptation within me. It seems that this short, relatively controlled stress/shock to the senses – both psychological and physiological has the effect of increasing my efficiency. It’s something I can’t articulate well yet but my experience thus far with open water swimming suggests that short bursts of high stress appear to be what we or at least what I am built for. Each time I plunge into the wild raging sea I reset normal, start afresh, emerge stronger. And as for mind so it appears to be for body. On a basic level looking at the fundamentals of health – I haven’t been sick in the past year (touch wood – or perhaps – touch water). No sneezes, coughs, runny nose, flu, no infections – no meds. My immune system has become more resilient, stronger. I believe that cold water immersion has been a major player in this priming of my nervous system and immune system upgrade. I have had very little musculoskeletal pain in the past year which may or may not be related to my cold water adventures. I have increased my circulatory efficiency and improved my core body temperature regulation. What are the Mechanisms at Play? This is a sure fire way to prime the immune system/nervous system and step into THRIVE Mode if ever I’ve come across one. While the people of the West of Ireland have been dipping into the sea for decades and enjoying the benefits for body and mind, a Dutch man also found solace in the Ice Water of his native Netherlands. Wim Hoff ‘The Ice Man’ has turned current Immunology theory and practice on its head by proving that the Innate/Autonomic Nervous System response can be influenced. Not only has he proven that the body’s Immune Response can be manipulated, he has also proven that we humans can influence our Autonomic Nervous System – something previously thought impossible. Wim Hoff Method uses a combined approach of cold exposure/breath work/mindfulness. Here is a neat synopsis and critique of the evidence and studies thus far regarding the Wim Hoff method and its possible benefits/negative effects – which makes for interesting reading. This new research raises as many questions as it answers but it sure is food for thought. The science and our understanding of the mechanisms at play will no doubt come with time. In the meantime I will listen to the innate intelligence of my own body and its response to immersion in the cold waters of the Atlantic Ocean. In my own personal journey over the past year I have found solace of mind and body. I have upgraded my physiology to enjoy a painfree and illness free life. I am alive, I am healthy, I have moved from Survive to Thrive mode – for this gift the wild Atlantic has offered me – I am grateful.